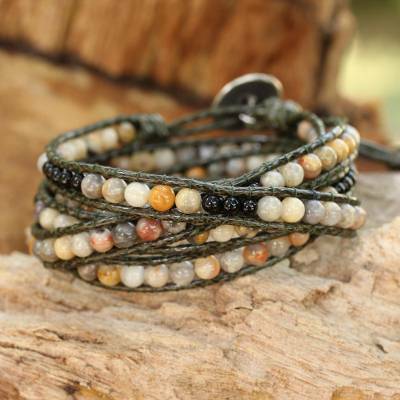 Hand Beaded Jasper and Onyx Wrap Bracelet, "Thai Autumn"
Autumn's radiance finds an expression in gemstone jewelry. By Thailand's Siriporn, this design wraps several times around the wrist. The bracelet features colorful jasper and sleek black onyx, and closes with a silver bead from Thailand's hill tribe artisans. You can find jasper and onyx wrap bracelet 'Thai Autumn' by Siriporn in jewelry categories such as Hill Tribe Bracelets, Bohemian Bracelets, Birthstone Bracelets, Jasper Bracelets, Onyx Bracelets, Silver Bracelets, Fine Silver Bracelets, Nylon Bracelets, Wrap Bracelets and Beaded Bracelets. Enjoy exploring these sections for other Novica treasures.